I’ve spent the last 3 years really kind of dicking around with cycling. I’ve walked away with the occasional win at a local race and more mediocre finishes than I’d care to remember. Last July, after an embarrassing performance at Mt. Hood and heading into master’s nationals I decided to hire a coach for the foreseeable future. With only 6 weeks of work I was able to walk away with a national title in the TT and a silver in the road race. I’ve spent the last 6 months killing myself to try and give it a go and race with the big girls. I raced cross from September to December despite feeling like cross is not my strength. Still, I managed to rack up three wins and a Cat 1 upgrade at the local level and hold my own with the pros at the USGP of Cyclocross in Bend. The last 3 months have been filled with incredibly intense training. I’ve spent more hours in the saddle than I ever have before and my training has been meticulous and focused. I’ve dropped over 10% of my body weight and totally cleaned up my diet. Where I used to be plagued by stomach problems and an inability to manage my eating and weight, I’ve been able to focus, buckle down, and keep the weight off while still eating a healthy and balanced vegan diet. March 10, 2012 was my first race of the season. Coach had me race with the Cat 3 men rather than the women so I could just race without putting pressure on myself to win or help a teammate win. I mostly love racing with the men. I get the bonus perk of racing with my husband and I can really just try anything without having to be responsible to anyone but myself. I had a great day until 3 miles from the finish when I along with probably 25-30 guys got taken out by a junior making a pretty dumb move. I walked away with a few scrapes and bruises but nothing that prevented me from doing a hard ride the next day. Last weekend was my first race with the ladies. I was so nervous I felt like I was on a first date. I was scared that all my training wouldn’t manifest in being able to actually race well. I was nervous that other girls had trained harder than me. I was scared to let myself or my team down. The race was flat and a little windy. Not really the best race for me but a good race for my team. My teammates and I threw out several attacks and gave chase to all of the other moves in the first half of the race. About 30 miles into the 60 mile race, our average pace was barely over 20 mph. I decided to shake things up a bit and attacked on a long flat stretch from second wheel. I looked under my arm and saw a gap of about two bike lengths so I decided to put i n a hard 2-3 minute dig. After 2-3 minutes I had a gap of maybe 150 meters and from there I decided I would do another 15-20 minutes at threshold (thanks coach for making me use my power tap). When I came through the start finish line, I had maybe a :45 to 1:00 gap so I just kept plugging away. After 20 or so minutes I dialed it back to a high tempo. I was aggressive through the corners since the roads were wet and I wanted to use them to pick up precious seconds. I recovered a little on the downhill and tailwind sections and tried to not blow up over the little rollers. Going into the final lap I got passed by the 1/2 men who sat up just after passing me. I kept the same tempo and ended up passing them back before they surged again. Right after that happened I was neutralized for probably 2-3 minutes. Since I had no idea how far up the road I was (I hadn’t gotten any time checks that I could hear) I started to panic and as soon as my lead car let me go, I put in another hard 5 minute effort. Finally, with 6 or so miles to go and after having been away for over an hour I looked behind me and … nothing. There was no one even in sight. I continued to push until the last 200 meters when I finally allowed myself to sit up and celebrate (I totally spent the last 6 miles planning my salute … I think I nailed it). My teammates were also awesome and did a ton of work to either neutralize or go with any attacks. In the grand scheme of my bigger goals, winning a local race like Sequim isn’t a huge deal but in a way it is. 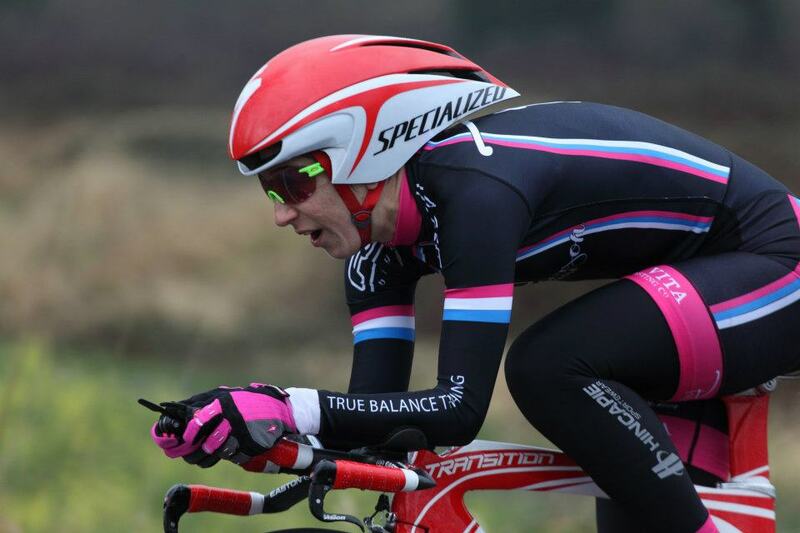 I see my strengths as a cyclist in my climbing, my endurance, and my time trialing. A flat windy race is not an ideal race for me and in general I would see myself as more of a leadout in a race like Sequim, which was going to be my job if I hadn’t gotten away. Being able to put in a big enough attack to get a gap and then finish the race with a 4 minute advantage over the field is a huge achievement in my book. I of course don’t expect to be able to do anything like this at the pro level but I know if I can ride off the front of a local 1/2 race then I can likely be active in a pro race. I tested myself this weekend and I passed with flying colors. 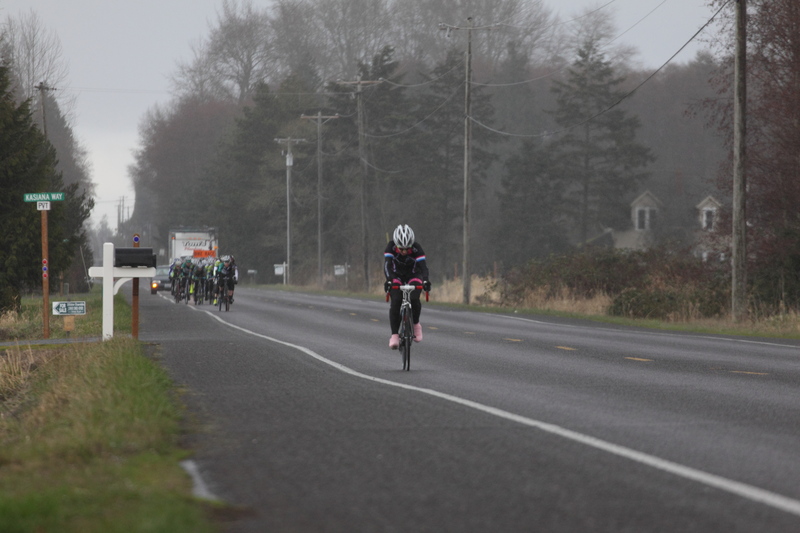 Sunday was a local flat 9 mile time trial in Snohomish, WA. Long story short, we got delayed for an hour due to snow and when I finally did race, I hadn’t warmed up and was immediately so cold that I couldn’t move my hands. I kind of botched the turnaround and couldn’t really put myself into the pain cave the way I had hoped to in the last 3 miles. That said, I still managed to win over another pretty dang good time trialist. I didn’t make my personal goal of going ~21 minutes (I finished in 21:26) but I’ll blame that on the conditions and the extra 10 lbs of clothing I was wearing, including my fleeced cyclocross skinsuit. I have a couple more TT’s before my first big race in April as well as a few road races with some climbs. After this weekend I’m feeling a lot more confident that my goals are possibly within my reach. I’ve gotten so much support from my friends, family, teammates, and coach I feel like I’m at the beginning of a great season. This entry was posted in Racing and tagged palmare, race report, road race, time trial. Bookmark the permalink.